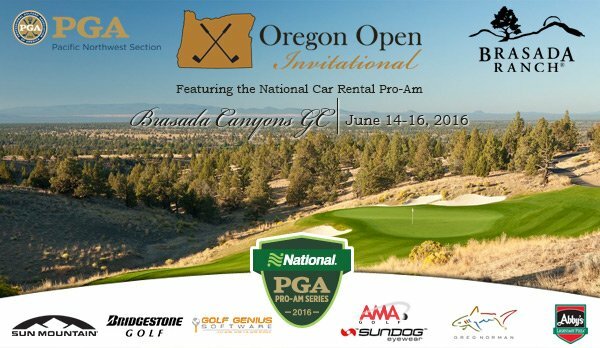 The final round of the Oregon Open Invitational featuring the National Car Rental Pro-Am took finished this afternoon at Brasada Canyons. 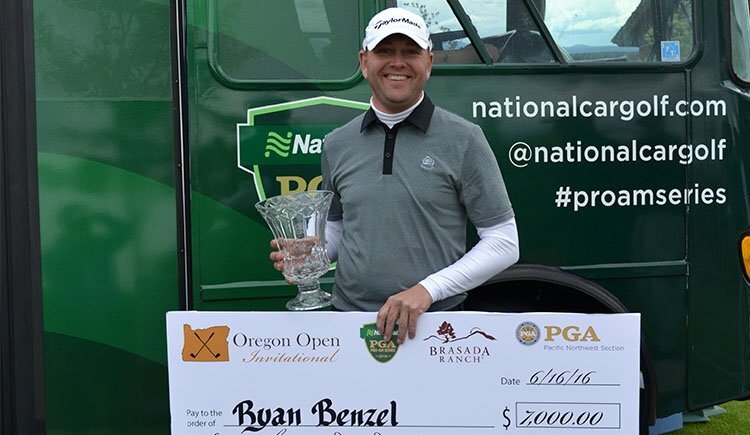 PGA Professional Ryan Benzel of Sahalee CC (Sammamish, WA) birdied the final hole to win by two strokes and take the title of Oregon Open Invitational Champion with his low score of 69. Two strokes back of Benzel was PGA Professional Darren Black of Rainier G&CC (Seattle, WA) and amateur Justin Kadin of Tetherow GC (Bend, OR). Winning the team best 2 of 4 net team competition yesterday was the team comprised of PGA Professional Darren Black, PGA Professional Tim Feenstra of Broadmoor GC (Seattle, WA), amateur Mike Haack of Meridian Valley CC (Kent, WA) and amateur Matt Marrese also of Broadmoor GC. Winning the Four-Ball team competition on Wednesday was PGA Professional Darren Black and amateur Mike Haack. Sponsored by National Car Rental, the Official Rental Car of The PGA of America, the event is one of nearly 100 new and existing amateur tournaments across the 41 PGA of America Sections nationwide being linked together to form the Pro-Am Series. National created the tournaments to help further the PGA of America’s mission to grow interest and participation in the game of golf at local levels. The tournament at Brasada Canyons consisted of 48 teams competing in a 36 hole best 2 of 4 net team competition, Pro-Am Four-Ball as well as 54-hole individual competition. Participating teams from each Pro-Am Series tournament are entered in a random drawing to receive a VIP golf experience with Keegan Bradley, the winner of the 2011 PGA Championship, and his father, PGA Professional Mark Bradley. The Bradleys serve as ambassadors for the Pro-Am Series. For more information about the National Car Rental PGA Pro-Am Series, please visit www.nationalcargolf.com. Fans can follow the Series on Instagram and Twitter @NationalCarGolf and participate in the conversation using #proamseries. This championship dates back to 1905 when sheep mowed the fairways at Waverley CC, George Smith, a Scot from Oakland, CA won the Oregon Open’s inaugural championship including a course record 74. Little did he know that some of golf’s most prestigious names were to follow in his footsteps such as Tommy Armour, Horton Smith, Chuck Congdon, Bob Duden, Bill Eggers, Jerry Mowlds, Pat Fitzsimons, Rick Acton, Peter Jacobsen, Jeff Coston, and Mike Davis. And only three men have won the title three or more times; Bill Porter (3), Rick Acton (4), and Bob Duden (8). The tournament scoring record is held by Brian Nosler at 198, set in 2009 at Brasada Canyons. Designed by native Oregonian Peter Jacobsen and Jim Hardy, Brasada Canyons Golf Course in Powell Butte, Oregon is undeniably one of the most beautiful and enjoyable Oregon golf courses. The course opened on September 1, 2007 and is known for the best 18 views in Central Oregon.